Further detailsin: D. Aurelio Bonaca, Religione e beneficenza in Trevi (Umbria), notizie storiche. Visualizzazione ingrandita della mappa The church stands on a pleasant hill at 550 m above sea level with a splendid view onto the valley, and can be reached from Bovara by a little paved road. It is first mentioned in papal briefs in 1177 as a dependency of the Abbey of S. Pietro in Bovara, but betrays its Lombard origin by its dedication to St. Michael the Archangel; it must therefore have been founded several centuries before the earliest documentary evidence. 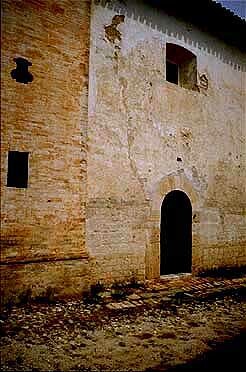 Enlarged and reworked over the course of the centuries, it has nonetheless retained from the original Romanesque building part of the façade, its modest doorway and the north wall. 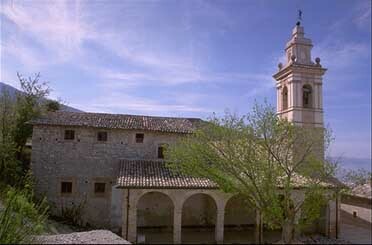 The former convent of S. Arcangelo, from the north. The lower portion of the belfry and the ancient façade of the Romanesque church. According to a pious legend the Virgin appeared here in 1646 to a shepherdess. Since then it became a place of pilgrimage of such importance that the municipality had to intervene to widen the road. In 1656 a large votive procession was held here to free Trevi from the plague. The belfry and the adjoining convent date from that time. A feast is celebrated here at Pentecost; processions from Trevi and all her villages used to wend their way up to the church on the three festal days, and up until just after World War II the mountain villages still used to make their procession on Pentecost Monday. "Amici di S. Arcangelo", the association of Friends of S. Arcangelo, whose worthy aim was to restore the large rooms of the convent and to highlight the entire compound, was dissolved after many years of generous and laudable volunteer work. Over the door, right up against the window, an old sundial can be seen, without its gnomon, but otherwise complete with its hour lines and frame. 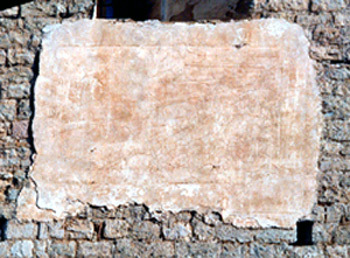 Restoration work after the 1997 earthquake led to its rediscovery by bringing back to light the stone of the façade that had been covered by a layer of stucco; paradoxically the dial is now at greater risk because its edges, no longer protected by that stucco, allow rainwater to seep in.